Any dedicated sports enthusiast knows that having proper equipment is crucial in any field. Naturally, this is also true for MTB. Thus, how you choose to dress for mountain biking is an essential part of your success, which is why you need to know everything there is to know about this. Nobody is born possessing prior knowledge in any field, which is why it’s important to learn. This is equally true for the topic at hand. Therefore, here are five tips to help you choose the right apparel for mountain biking. No matter what make and model of MTB clothing you prefer, you need to remember one universal thing about the shorts you wear: they must be padded. The crotch padding in them reduces friction and absorbs moisture, which ensures that you remain guarded and comfortable throughout the entire duration of the ride. Nevertheless, due to the very nature of this item, it can easily become a playground for germs and bacteria. To keep them in good shape, all you have to do is use dedicated cleaning and conditioning aftercare products regularly. For instance, Nikwax’s BaseWash and BaseFresh work wonders on any type of technical underwear. Such products help clean and condition the fabric, while at the same time deodorizing, accelerating drying and preventing the buildup of sweat and bodily odors in your favorite pair of padded biking shorts. Furthermore, they also improve upon overall cooling efficiency of the fabric, which makes your equipment even more reliable. As for what the best style is because aerodynamics isn’t the main concern in mountain biking, your shorts of choice can either be figure-hugging or baggy. The latter is great for layering, which makes them a lot more versatile. Thus, in the case of colder weather conditions, you can either throw a pair of leggings under them and you’re all set. No matter what your skill level is in the field of MTB, you need to remember that it’s still an extreme sport at the end of the day. Even if you own a sturdy and durable ride, such as the diamondback sorrento mountain bike, you are still not fully protected from possible accidents and injuries. Helmet. The best option is a carbon-made helmet that covers your entire face, thus offering adequate cranium protection and neck support. Thus, this sensitive area will be safeguarded during a crash. Gloves. To ensure that your grip on the handles and brakes stays firm and your knuckles are protected, specialized riding gloves are a must-have. Choose the full-fingered variant for the highest level of protection. Goggles. While a pair of regular sunglasses might protect your eyes from UV rays, they aren’t reliable in extreme sports. When out on the trail, safety goggles are ideal because they are sturdy and reliable. Knee pads. 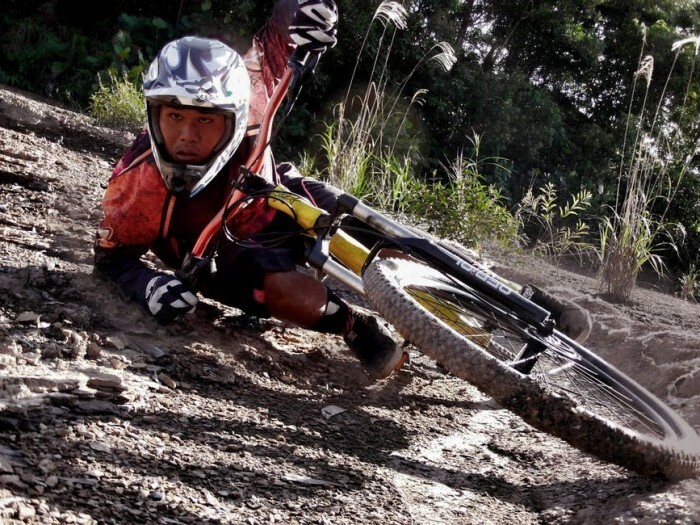 It goes without saying that your knees need special attention while out on your mountain bike. They are the one joint that needs the most protection, so make sure they get that via some sturdy knee pads. Shin pads. The ideal pair of shin pads should feel more like leg warmers than anything else. This piece of equipment needs to be light and breathable, while still protecting your leg at the same time. A lot of beginner MTB enthusiasts make the mistake of bringing a backpack that is either too small or overall improper for the purposes it must serve on the ride. Ideally, yours should be able to carry not only snacks and an extra bottle of water or electrolyte sports drink for a quick hydration boost, but also a few on-the-road repair tools. This is even more important if you plan to go on a day trip that involves a longer trail. Not only will your body need replenishing, but your bike might as well. Thus, a small toolkit with a mini-sized pump, some wrenches and other crucial hardware for quick fixes is recommended if you want to enjoy a smooth ride. Just like it is the case with any other intensely physical activity, the type of shoes you wear is incredibly important. To determine what the most suitable alternative is, you will need to analyze the specifics of the trail you are going to ride. How much time will you spend walking and how much will you spend pedaling? Rubber outsoles with added grip are perfect for walking, but if you’re going to pedal a lot more, it’s better to choose stiff cross-country shoes. These are far less appropriate if a lot of walking will be involved, but you will need to pull through if you want to pedal more efficiently. Finally, make sure they are also waterproof in case things get wet and cold real fast. Weather conditions can make or break a ride. While it is possible to withstand extreme conditions on your bike, it’s recommended to steer clear of stormy periods. However, rain is extremely unpredictable sometimes, which is why wearing waterproof clothing and knowing how to properly layer it is an essential skill during the wetter seasons. Still, not everyone can afford to own ten different types of MTB clothing. If you don’t have the budget for purchasing new items, waterproofing your old clothing works too. There are plenty of products for this on the market catered for all sorts of materials, so you will surely find one that works for you. Some of the best options on the market nowadays are in Nikwax’s TX. Direct line, either in the wash-in or spray-in variants depending on your needs and preferences. This gives your clothes water repellant properties. At the same time, the formula preserves and even enhances breathability. While the former is activated in the washing machine, the latter is simply applied directly from the tube, which increases convenience. Everything from your shorts and shoes to the goggles and helmet you choose will define your MTB experience on any trail. This is why it’s important to always be prepared and put your safety first above everything else.